Melt in your mouth, sweet and salty, this Christmas Crack Candy recipe is perfect for the holidays. If you haven’t tried Saltine toffee yet, what are you waiting for? Saltine Toffee. Otherwise known as Christmas Cracker Candy. Or Christmas Crack for short. 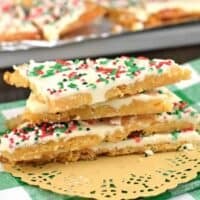 I’ve been making varieties of saltine toffee for years, but when I’m in a hurry, this holiday favorite is a cinch to whip up! The first time I tried Christmas Crack, I thought, wow, this is a different texture of toffee than my traditional English Toffee recipe. But, I was intrigued. In love. And I knew I had to try more. 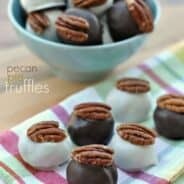 Thus began my love of easy cracker candy recipes. 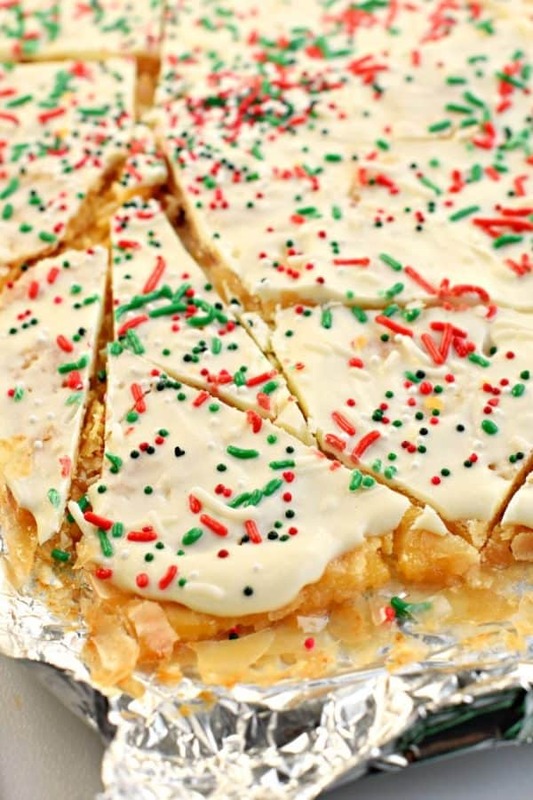 Making this holiday saltine cracker toffee recipe is really easy. From start to finish you’ll need less than one hour! To start, place a piece of parchment paper (or aluminum foil) on a 15 x 10 x 1-inch baking sheet. Line with 40 saltine crackers in a single layer. This is about 1 sleeve of crackers. Set aside. Melt your unsalted butter in a small pan, over medium heat, then add your granulated sugar. Bring this mixture to a rolling boil. Remove from heat once boiling. Pour the melted butter and sugar mixture over the saltine crackers, slowly, making sure that all the crackers have been covered in butter. 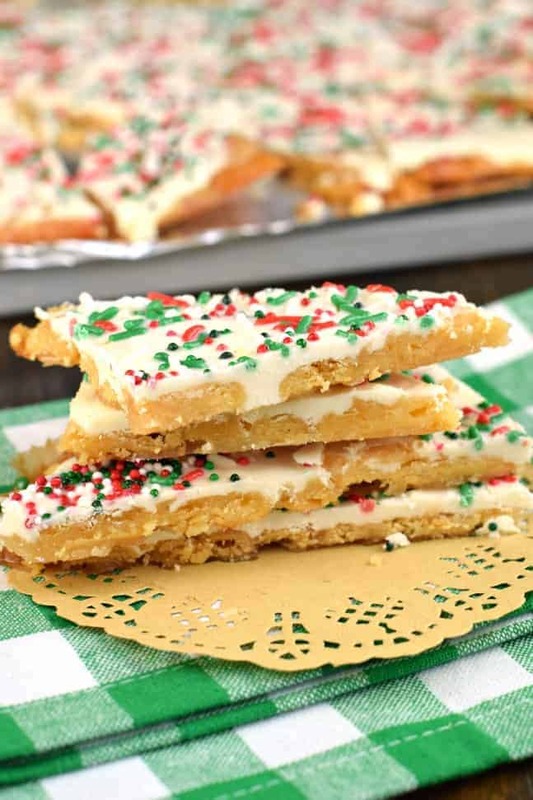 All that buttery goodness is going to create the melt in your mouth saltine toffee! Bake this for about 13 to 15 minutes. You want to make sure that the crackers look lightly browned and caramelized. Remove from oven. In a small bowl, melt the chocolate (I use Ghirardelli white chocolate wafers for best results). Using an offset spatula spread over warm toffee and immediately add sprinkles. Allow the toffee to set up and harden (about 30 minutes) then use a sharp knife to break into pieces. Store Christmas Crack in an airtight container at room temperature for up to 5 days (if it lasts that long). ENJOY! There are so many great varieties of Christmas Crack. Choose one of your favorites! Or bake a whole bunch and serve the assortment on a large tray. 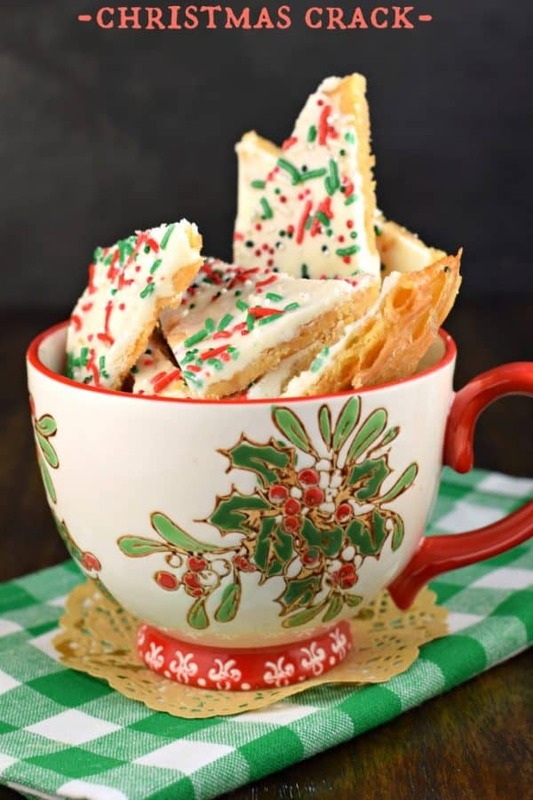 This Peppermint Cracker Toffee is ridiculously easy and delicious. Crisp, buttery toffee topped with white chocolate and peppermint candy! 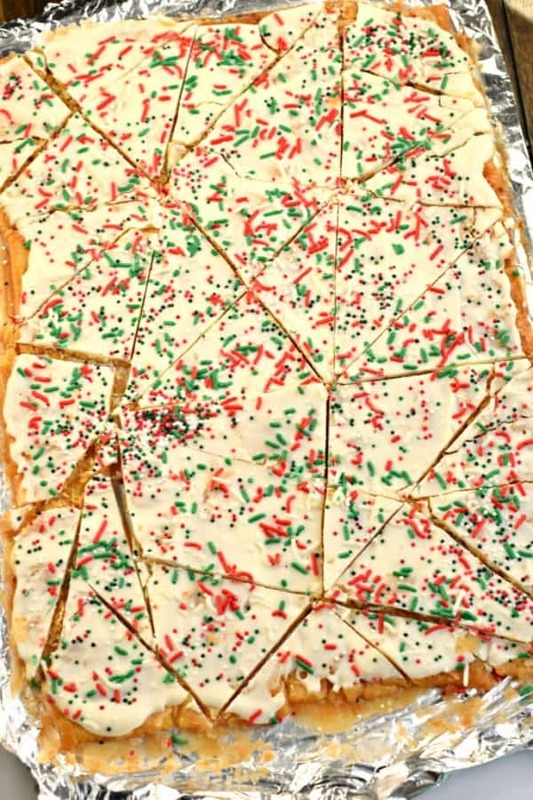 Make the toffee the same way as above, except instead of sprinkles, top with crushed candy canes. 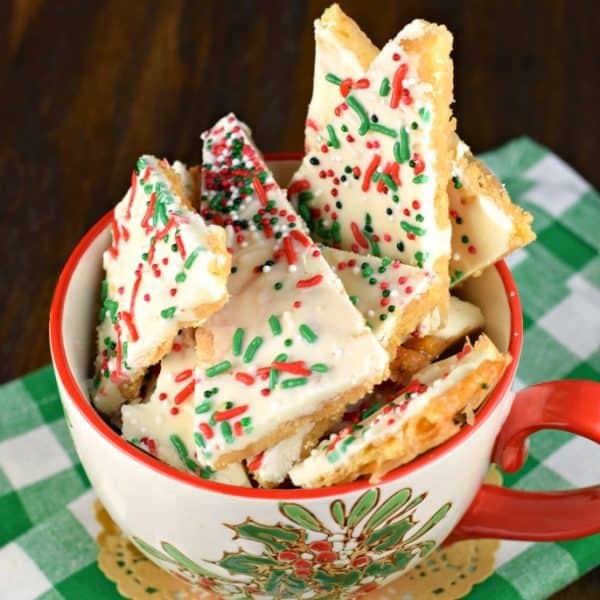 Another easy recipe variation would be this White Chocolate Pecan Saltine Toffee recipe. Again, using the same saltine toffee recipe as your base, top this cracker toffee with melted white chocolate and chopped pecans. So buttery and nutty, you’ll love the sweet and salty combo! Love Cookies and Cream desserts? This Oreo Toffee is topped with a combo of semi-sweet chocolate chips and white chocolate chips. Once you’ve swirled your chocolates, add your crushed Oreo cookies for a finishing touch! 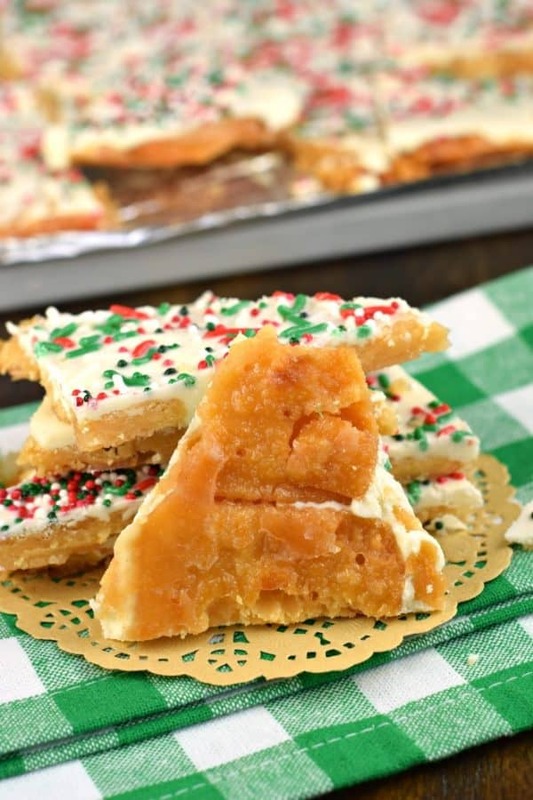 This Peanut Butter Cracker Toffee recipe is downright delicious. Add some peanut butter to your butter and sugar mixture and you’ll have a new melt in your mouth treat. 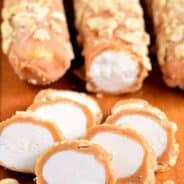 Top with melted white chocolate and enjoy! 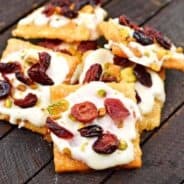 Another holiday Christmas Crack recipe: Cranberry Pistachio Saltine Toffee. Salty and sweet, tart and delicious. ENJOY. Why yes. These Brickle Bars were actually the first cracker toffee recipe I ever ate…and then made for the blog! Transform your graham crackers in a new, melt in your mouth treat. Top with chopped nuts and coconut, and bake. Melt the chocolate chips and drizzle over the top. You’re going to love these Caramel Coconut Cracker Toffee bites! This easy, no bake recipe is the answer to your Chocolate and Peanut Butter craving! Buckeye Bars are decadent bites of candy that melt in your mouth! Sweet vanilla peppermint fudge packed with crushed candy canes! This Candy Cane Fudge NEEDS to be included on your holiday dessert plate this year! Festive Grinch Peppermint Fudge is creamy and melts in your mouth! You’ll love how easy it is to make, and it’s fun to see on a plate of cookies and candy! 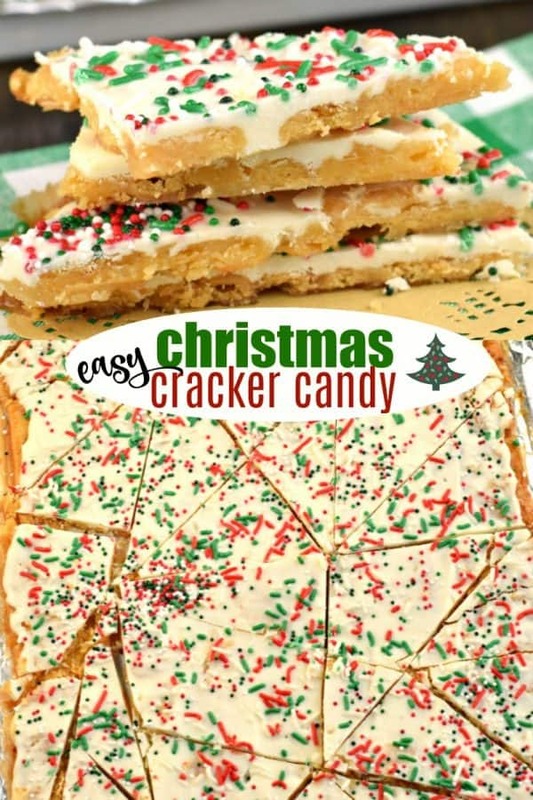 Melt in your mouth, sweet and salty, this Christmas Crack Candy recipe is perfect for the holidays. If you haven't tried Saltine toffee yet, what are you waiting for? Line a 15x10x1-inch baking sheet with parchment paper then with the saltine crackers. Set aside. Preheat oven to 375°F. Remove from oven. Melt white chocolate and spread over the top of warm toffee. Add sprinkles immediately (if desired). Allow chocolate to set and break into pieces. Store in airtight container for up to 5 days. What a pretty treat perfect for any cookie exchange. I’m definitely a sprinkle girl and don’t know how to pick which toffee recipe I’ll make first! I love how adorable it looks stacked in that Christmas cup. That gives me the inspiration to set several treats around for our Christmas party so no one has to wrestle to get to the goodies that they want. This is, by far, my favorite Christmas treat!!! My favorite! Love this pretty version, can’t wait to try it with white chocolate! I’m in love with Christmas Crack too! If it’s in the house it definitely won’t last more than 5 days! This is a great recipe and so foolproof. I love the white chocolate topping and the Christmassy sprinkles. Still have to make mine this year. Festive and addictive!! What a great recipe. This is a perfect Christmas treat!! I love that it is so easy to make! I made the christmas crack. This is an easy recipe and delicious.